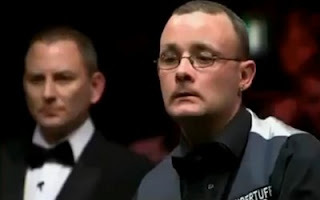 Murphy, who held a 3-0 advantage over his opponant showed plenty of glimpses of his old fluency in a solid performance against the local favourite. But it all began so well for Martin when he confidently stroked in breaks of 41 and 60 to take the opener. Gould also looked in perfect position to lead 2-0 when a horrific miss on an easy green sent him back to his seat for a rest and allowed Murphy a reprieve. From it he made 33 and then took full advantage if a poor safety shot from Martin to mop up the remaining 26 points to level at 1-1. As Martin was left to reflect on what might have been following a misjudged safety Shaun sunk a cuttable red to the centre. Striding purposefully around the table Murphy fired in a 107 to move 2-1 in front. And it got even worse for Gould as he was forced to sit in his seat and watch as Murphy's 59 accounted for the fourth frame to leave the former world champion holding a 3-1 lead at the mid session interval. Returning Murphy tightened his grip on the match with an 82 to lead 4-1. Since that miss on the green it had become one way traffic at Alexandra Palace. 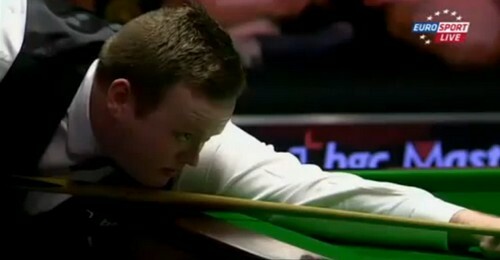 But a missed red to the corner with the rest from Murphy finally gave Martin some relief as he stopped the rot, rolling in a decisive 50 break to reduce his arrears to 2-4. But that was all Shaun was going to allow him as he capitalised on a missed red from Gould to roll in an 89 to put himself one frame from victory. Minutes later he signed off in style with a clearance of 139 to seal a 6-2 victory and set up a quarter final with one of Mark Selby or Stephen Lee.